Estimated time to complete the experiment: 2.5 h.
For these chemical transitions, use a plastic plate with at least six wells (with a minimum capacity of about 3 mL each). If desired, a thin-stem pH probe connected to a pH meter may be used to monitor the pH in the wells (although this reduces somewhat the volume available for the tests; 5- or 10-mL beakers may be used instead of the well-plate). If even smaller volumes are desired, use a porcelain spot test plate. For color comparison purposes, place 2 mL of 0.1 M CuS04 in the first well. Place 2 mL of 0.1 M CuS04 in the second well and add dil. NaOH drop wise. When the pH reaches approximately 4.5, a sky-blue precipitate of Cu(OH)2 forms. At this point, stop adding NaOH. Save the resulting mixture of solution and precipitate. Take approximately 1 mL of the reaction mixture produced in the previous step and place it in the third well. Add a few drops of a highly concentrated (e.g., 8 M) NaOH solution. Stir. Caution: NaOH dissolution is an exothermic process, and concentrated NaOH is very caustic. Eye protection must be worn. A purplish deep-blue color indicates the production of cuprite ion, Cu022-. Keep this solution for later. If desired, the absorption spectrum of cuprite (\max = 620 nm) can be compared to that of Cu2+ (\max = 811 nm). Remove half of the contents of the third well and add dilute H2SO4 drop wise (with stirring) to the mixture remaining in it to a sky-blue color, which indicates the formation of Cu(OH)2 precipitate. Upon further addition (with stirring) of H2SO4 to the mixture remaining in the third well, the Cu(OH)2 precipitate starts dissolving and a normal blue color appears, indicating that copper is back to its initial form (i.e., Cu2+). of the reaction mixture is above 9. Then, heat so as to boil-off the excess water and to dehydrate the hydroxide. A black precipitate of CuO now forms as a result of the hydroxide dehydration. Caution: Some splashing may occur. Wear safety goggles. If desired, the CuO thus produced can be treated with concentrated acid (e.g., 50% HNO3) as to yield blue Cu2+. If the CuO is treated with a strong base (e.g., a few drops of conc. NaOH and a few drops of H2O) and heated, the mixture yields the deep-blue Cu022- ion. (Some time must be allowed in order to notice the blue color). Caution: NaOH dissolution is an exothermic process. Concentrated nitric acid emits toxic fumes, handle under a fume hood. Wear gloves and safety goggles. To observe the electrochemical transitions, use the remaining wells on the well-plate. Dip into each well the required electrodes (e.g., 5 cm of stainless steel wire, SS, Cu wire, or graphite rod) as described below. Place 2 mL of 0.1 M CuS04 in the fourth well, and adjust the pH to 1-2 with dil. sulfuric acid. 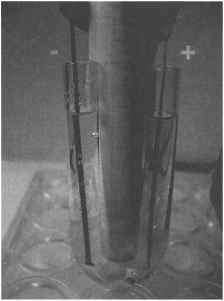 Place two SS wires (cathode and anode, respectively) in the solution. (Make sure that they do not touch each other). Connect them to a 9 V battery or to a DC converter set at approximately 9 V (this is the power source). Within a few minutes, the cathode will be covered with a reddish deposit of Cu°. To test for its presence, remove the cathode and dip the reddish portion in a small test tube (e.g., 5 cm long, 0.5 mm diameter) more than half-filled with 50% HNO3 for a few seconds. Brownish fumes of NO2 are indicative of the presence of Cu°. Caution: Do this step under a fume hood. Use safety goggles and gloves to handle the 50% HNO3. These precautions are imperative because NO2 fumes are toxic, and HNO3 is highly corrosive to human tissue. Place 3 mL of 0.1 M CuS04 in the fifth well of the well-plate. Add Zn metal (either a few mg of dust or a pea-sized pellet). After some minutes, observe the Cu° deposit on the Zn surface as well as the discoloration of the blue solution. Compare the color of the solution with that of the solution in the first well. Place 3 mL of 0.1 M CuS04 in the sixth well and carefully adjust the pH to approximately 3.5 with dil. sulfuric acid or hydrochloric acid (and NaOH if needed). Connect two SS wires to each pole of the power source. Stir. Before long, an opaque reddish deposit forms on the cathode surface. To make sure that the deposit is not Cu°, remove the cathode and dip the reddish portion in a few milliliters of 50% HNO3 as in step 6. Brownish fumes of NO2 are not emitted here since it is not Cu° that was formed, but CU2O. Caution: same as in the aforementioned step. An alternative test can be performed in the same way, but using dil. 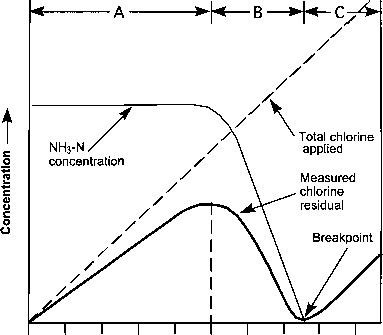 HC1 (for example, 0.05 M) instead of 50% HNO3. Here, the Cu20 deposit dissolves, whereas Cu° metal would not. Figure 1. Alternative experimental cell for transition number 9. (Reprinted from the Chemical Educator, Vol. 10, No. 5, 2006, pp. 348-356, with permission). of pouring the solution with the Cu2+ newly produced into the preparation beaker and add NH4OH as needed to form the highly-colored [Cu(NH3)2]2+ complex. Place 2 mL of 8 M NaOH in a 5- or 10-mL beaker. Insert a copper wire as the anode and either a graphite rod or a SS wire as the cathode. (To observe the Cu° to Cu022- transition in a relatively short period of time, it is best to connect two or three 9 V batteries in parallel as to have the same voltage, but a higher current). Then, connect the electrodes to the power source (the copper wire to the positive). In a few minutes a deep-blue color forms in the solution near the anode surface. Caution: NaOH is very corrosive to skin tissue and to the eyes. Use safety goggles and gloves. All the solutions generated in this experiment must be placed in a container labeled for this purpose.